Colleen Haggerty lost her leg in an auto accident when she was seventeen years old. The journey of her disability has taught her about the power of her spirit and how it guides her body through this lifetime. 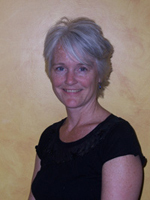 She is a trained SoulCollage™ facilitator, a process that guides people to their inner wisdom. As a trained life coach, Colleen coaches and mentors at her job at Big Brothers Big Sisters of Northwest Washington. She lives in Bellingham with her husband, two children, and her goofy dog.